The Suffering of the Poor. Poverty was a different beast during the Great Depression, and the politics of the poor was super-charged by the spread and seeming strength of Communism which claimed to be for the poor. 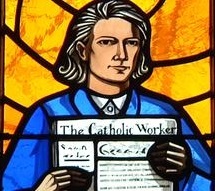 While her politics were more sympathetic with Marxism, it was her connection with the humanity of the impoverished and the awareness of their suffering that galvanized Dorothy Day’s passion for the poor. Her turn to Catholicism grew out of her awareness that Christianity was a message of hope to the poor, and that God has a passion for the poor and the marginalized. If we ourselves are not poor, and we do not truly know anyone who is poor, then we can allow poverty to remain political and theoretical for us. But God knows the poor, and he cares for them. I was struck this past Christmas with how amazing it is that Jesus was born poor. If the goal of the Incarnation was for God to become human and to die our death for our forgiveness, then certainly any human life he lived would have been sufficient. He could have come as royalty, right? But he did not. He entered human life and lived it as most of the world lives it, poor. When we in the church forget that, and we ourselves are not poor, we have lost a vital part of being the Church. Dorothy Day reminds me that I need to take off my blinders, look past my own problems and supposed “poverties”, and see those whom God cares for, and act accordingly. One must live with them share with them their suffering too. Give up one’s privacy, and mental and spiritual comforts as well as physical. The houses of hospitality were a place for such living with. Fraught with challenges, as her autobiography admits, it is also a risk that we are called to take. This reminds me of the school of thought now current that involved those of more means moving into a poor neighborhood to throw one’s lot in and to make a difference every day. I suppose there are different ways of being with the poor, but the importance of such a risk is great as Day teaches. Is not this what the Incarnation is all about too? Jesus came and “dwelt among us”, to quote John 1. “We cannot love God unless we love each other, and to love we must know each other. We know him in the breaking of bread, and we know each other in the breaking of bread, and we are not alone anymore. Heaven is a banquet and life is a banquet, too, even with a crust, where there is companionship. These are the words that end her story, in the Postscript. It seems this is the great lesson God has taught her over the course of her life and work, and it is what she has to teach us. The Church is the place where we can, with God’s help, break down the distance between us and others, especially others very different than us. It is the place where in our loneliness we can find the love of God with and in one another. This entry was posted in Books and tagged community, Dorothy Day, poverty on February 25, 2014 by revkamcclain.